The 2012 Barrua is similar to the hot vintage that proceeds it. This so-called "Sardinian Sassicaia" is made by the same people who brought us the legendary Tuscan red wine. Barrua is a blend of Carignano, Cabernet Sauvignon and Merlot that sees some 18 months of oak aging. 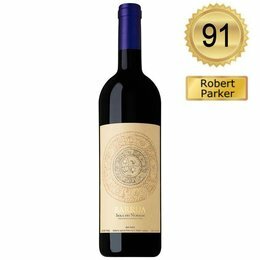 This edition shows a soft and slightly jammy style with dark blackberry preserves, dried cherry, black olive and generous secondary aromas of oak spice and tobacco. Barrua always shows impeccable balance. Considering the warm vintage conditions, this edition offers that same sense of overall harmony. The wine is engineered for either near or long term drinking. It should hold for a decade.